A Phase I/IIa Trial of Intravenous Immunoglobulin Following Portoenterostomy in Biliary Atresia. Acute-on-chronic liver failure in children with biliary atresia awaiting liver transplantation. Liver fibrosis in biliary atresia. Impact of Steroid Therapy on Early Growth in Infants with Biliary Atresia: The Multicenter Steroids in Biliary Atresia Randomized Trial. Clinical Consequences of Cardiomyopathy in Children with Biliary Atresia Requiring Liver Transplantation. Molecular signature of active fibrogenesis prevails in biliary atresia after successful portoenterostomy. Home-Based Screening for Biliary Atresia Using Infant Stool Color Cards in Canada: Quebec Feasibility Study. Experience with endoscopic management of high-risk gastroesophageal varices, with and without bleeding, in children with Biliary Atresia. α-SMA Overexpression Associated With Increased Liver Fibrosis in Infants With Biliary Atresia. Developmental assessment of infants with biliary atresia: differences between boys and girls. Identification of Serum Protein Biomarkers in Biliary Atresia by Mass Spectrometry and Enzyme-linked Immunosorbent Assay. Bile is a digestive juice secreted from the liver. Bile passes into the intestine through a tube like structure which is called bile duct. Bile juice is important for the digestion of fat in food and for absorption of fat soluble vitamins. Poor development of the bile duct is called Biliary Atresia. 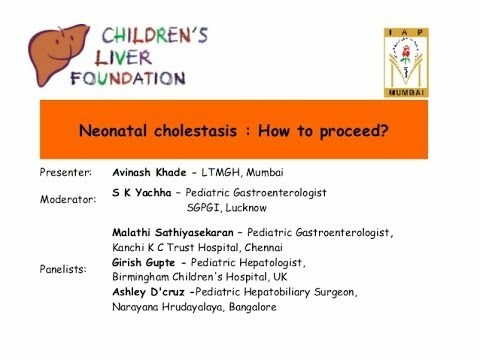 This can lead to cholestatic (direct) jaundice or liver damage. Biliary Atresia occurs in 1 in 10,000 to 20,000 live births. It is one of the commonest causes of neonatal jaundice.